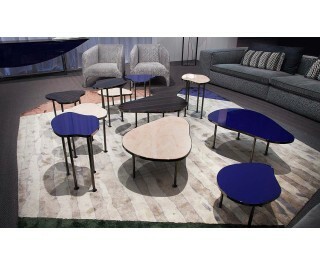 Funny coffee tables, combinable, interchangeable, to be used individually or in composition. They have soft and rounded shapes and they are composed of different materials: marble (Rosa Portugal, White & Black, Black Marquinia, Port Laurent or white Carrara), natural wood (oak, Canaletto walnut and ebony) and lacquered wood. The base is made of metal, bright black chrome finish.